Driving a car you will have to drive on the left hand side in the UK and the right hand side in Greece. Everyone will know which way everyone else is going by observing this simple rule. It is a lot more complex at sea! As a general rule if there is a collision causing damage and it goes to court, blame will be apportioned. The boat that hit you will pay some of the damages but you could pay some for not getting out of the way as it will be argued that you were not being watchful enough. In short, as soon as you realise that the boat that should get out of the way isn’t doing as they should, you should take evasive action. Yes, you could sue Cunard for its cruise ship wrecking the boat and killing your family but you would prefer your family to be alive than any money Cunard would pay. Looking at the other vessel, if they do not change their position to the left or right of you while coming towards you then it is likely they will hit you. 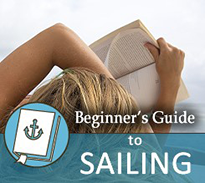 Generally, someone who is driving a motor boat or motoring their sailing boat will always give way to a sailing boat. The Queen Elizabeth cruise liner will have to give way to you in open water! However in busy waters where there is a deep water channel for larger vessels, the rule is reversed for big ships that would go aground in the water either side of the channel. In this case you have the exception ‘big ship / narrow channel’ where the small boat that would not go aground outside the channel will have to get out of the way. As a tip, unless you are absolutely sure the big ship has seen you, it pays to get out of the way as if she hits you you might not even scratch his paint, much less feel the crunch as she sinks you. If a fishing boat is trawling everyone must give way to them, as they are less manoeuvrable than a sailing boat. Fishermen are tough sorts and after they have hit you with their boat they may hit you with their fists too! If someone is towing someone else or a tug a barge / ship, they will also have priority over you under power or sail on the water. If they are not under command (out of control), perhaps due to rudder or engine failure, they also take priority. They take priority over everyone else unless anchored illegally for example in a channel (unless they are not under command). 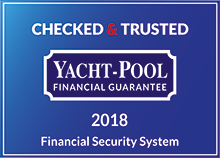 If you are on the starboard tack with the wind blowing from the port side you will have priority over another sailing boat who is on the port tack and has the wind blowing over the starboard side. If he has not seen you or is not changing course and you are on the starboard tack, shout ‘STARBOARD’ as loud as you can manage. If he doesn’t respond get out of the way. 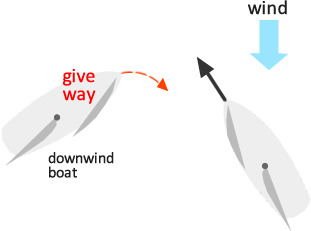 When two boats are on the same tack, the windward boat must stand off while the leeward boat has right of way. The boat being overtaken has right of way, but must hold a steady course to allow the overtaking boat to pass safely.